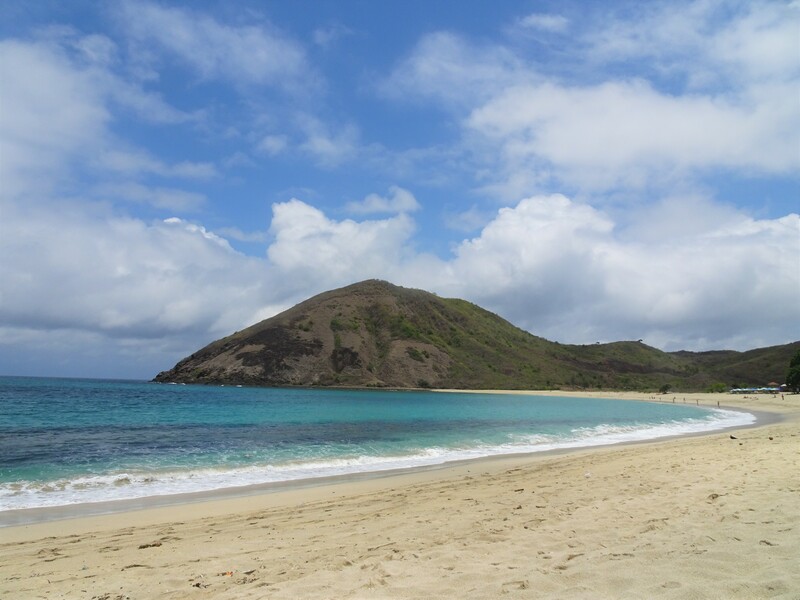 Kuta Lombok is apparently just like Kuta Bali 30 years ago : quiet beaches with turquoise water and white sand. A true gem! The official price for a taxi ride from Lombok airport to Kuta Lombok is 93 000 rupiah (October 2017). Taxi agencies will be screaming different prices to you. Don’t settle for more. The ride takes is about 20 minutes and the road is quite good. We rented a scooter (50 000 rupiah/day) from our hotel to drive east to the Tanjung Aan beach. We met a family of monkeys, many chickens and dogs and had sometimes a bumpy ride but no real difficulties. Don’t worry! Just avoid driving when it’s night time. The beach was beautiful and there was hardly anyone. Our closest neighbours must have been more than 20m away. A few old women are selling coconuts and soft drinks in the shade. There’s also a very Instagram-friendly swing. 10 000 rupiah to park your scooter. At sunset time, we joined many other travellers to watch the sunset from the top of the hill in Tanjung Aan. It was too cloudy to actually see the sunset but the view was nevertheless breaktaking. Our hotel for the first two nights was lovely. 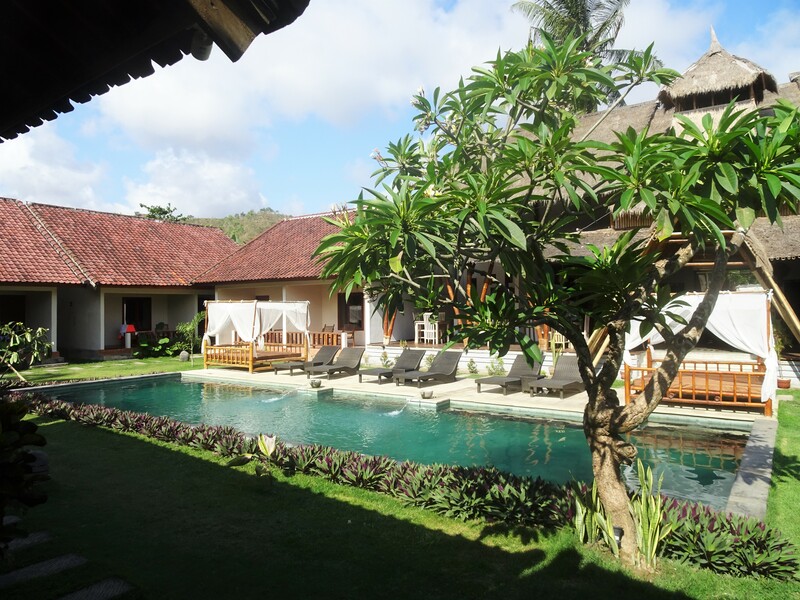 Kuta Baru Hotel is right in the centre of the ‘town’ but still very zen. The pool is great and the sound of the water falling from the statues makes the place very peaceful. The free drink offered on arrival at the restaurant thanks to our Genius status on Booking.com was perfect. About 40€/night for a big room with pool view. After surfing for the first time in Byron Bay in Australia, a friend recommended us to go to Kuta Lombok for improve our skills. On our way to Selong Belanak, we stopped in Mawun beach. You should too! This semi-circular beach is the typical one you see on television and you think you’ll never have the chance to actually see in real life. There were maximum 20 other people on the beach. Here too some warungs where you can eat or get something to drink. 10 000 rupiah to park your scooter too. I could basically live there forever but we had to leave, we had some surfing to do! Selong Belanak is warmly recommended for beginners. 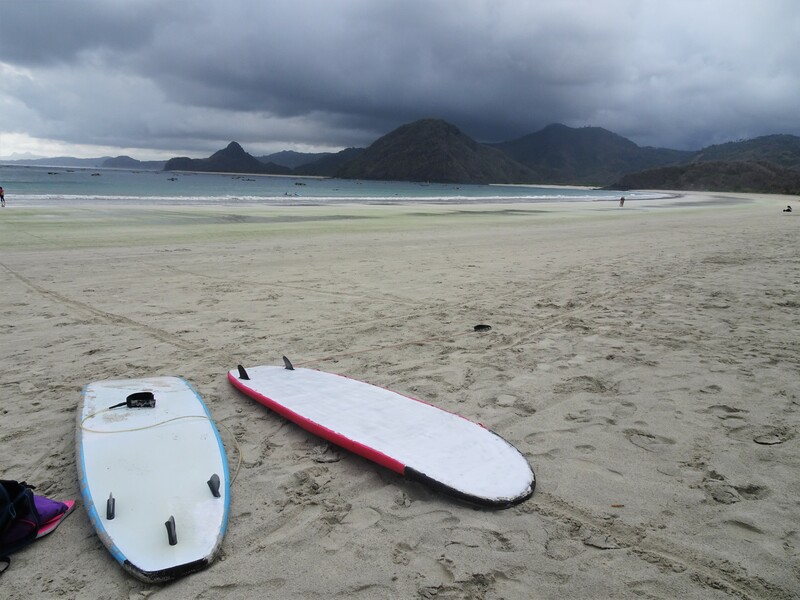 We rented our boards for 50 000 rupiah each. The guys also agreed to keep our belongings on the side. Better be safe than sorry ! Unfortunately, there were not a lot of waves that day and the weather was quite stormy. Less tiring than in Byron Bay but we were a bit disappointed not to be able to progress more. 10 000 rupiah to park your scooter as usual. Lots of places to rent boards and sunbeds, eat or get surfing lessons. 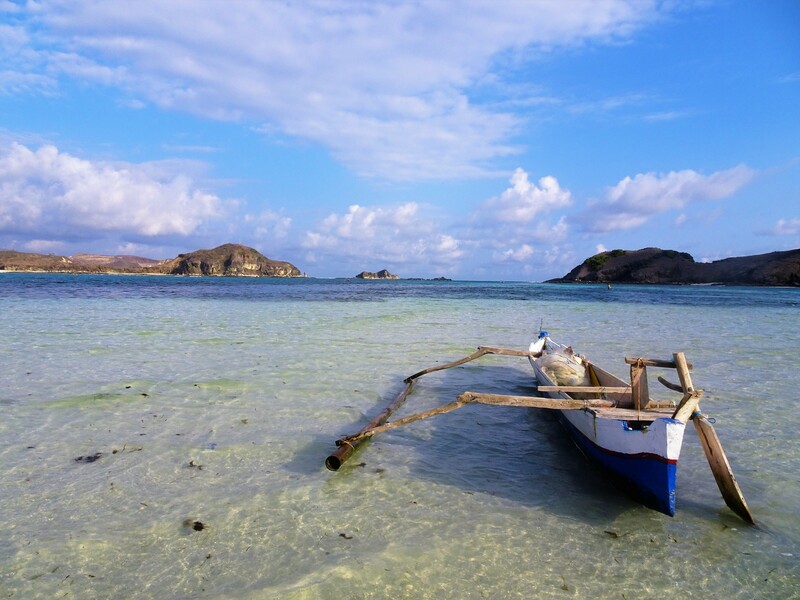 On the third day, we decided to get a taste of the famous Gili north of Lombok by visiting three smaller Gilis in the south! We booked a day trip through our hotel for 750 000 rupiah. Fair price. Our guide Tony (Whataspp: +6285338961287) was very nice and loved taking pictures of us! It took us 1h30 to reach the ‘port’ where many fishermen use their own boat to take the tourists to the nearby islands. 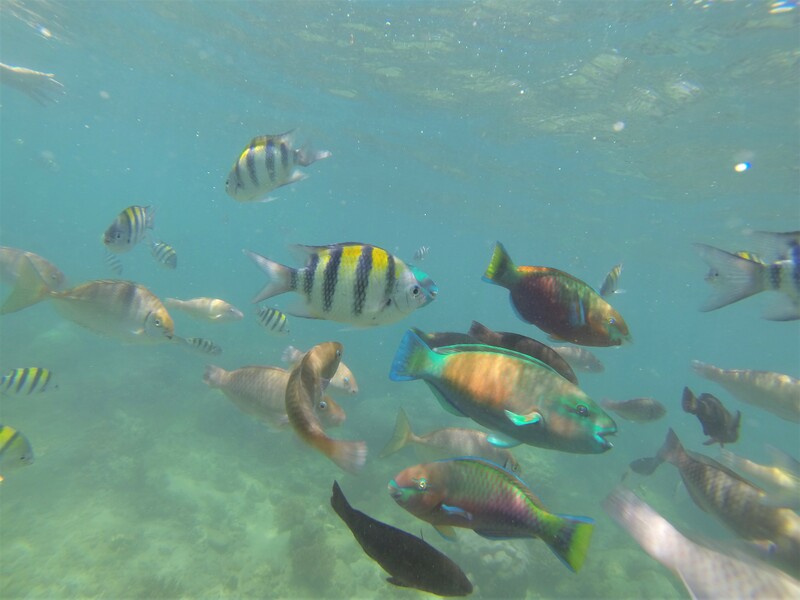 The first island is Gili Nanggu, the snorkeling stop with many colourful fish. Go on the right to discover a sunk fishermen house where they love to hide. Go to the left to explore the coral. We even spotted a murena! After a few hours – and later on we will discover two completely burned backs, we went to eat some nice fish right on the beach of Gili Sudak. Last stop was on the unhabited and tiny Gili Kedis. There’s nothing else to do there than sunbathe, rest, go for a swim and enjoy the quietness and the view. On our way back, our guide offered to stop in Sade to see Sasak traditional houses. It looked very turistic with numerous guides waiting to guide travellers. We decided not to stop as we were starting to need some rest (yes, doing nothing is tiring!) and curious to discover our next hotel! The hotel was simply heaven on earth: Origin Lombok is a peaceful place with comfy and enormous bedrooms/villas (about 50€/night). 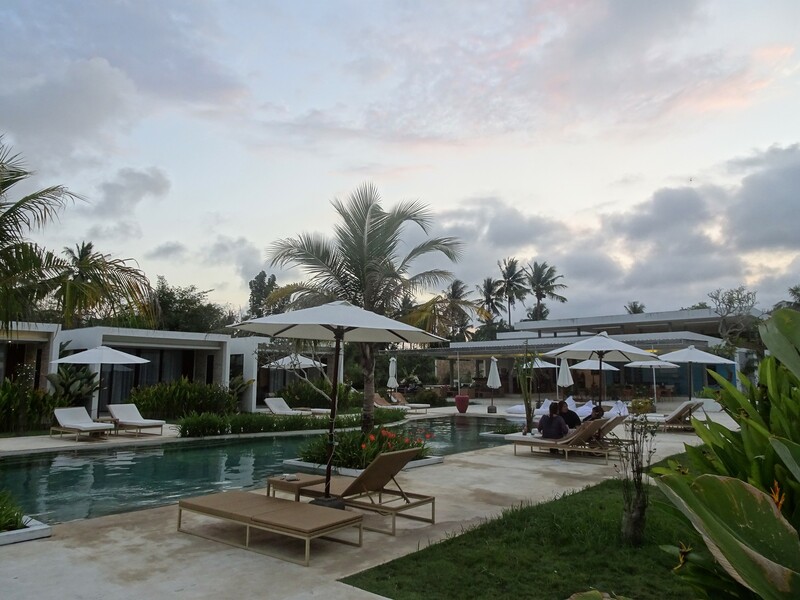 We arrived just in time to enjoy the sunset and happy hour in the pool. The first restaurant we discovered is Ketapapanga on the angle of the main street going down to Kuta beach and the beach itself. Indonesian and occidental menus at a very decent price. Delicious lemon juice. We also ended up there on the second night after being disappointed by the menu and prices of the Warung Bule. On the first night, we ate at the Japanese restaurant of our hotel (also open to non-guests) where my boyfriend fell in love with okonomiyaki while I was enjoying some tasteful sushis and rolls. For drinks, don’t hesitate go on the beach enjoy fire shows with a nice (and cheap) cocktail. You can also go and listen to reggae music at the Rasta Warung or join the Australian surfers at the Surfer Bar. We tested both and cocktails are equally as good! After Lombok, we spend two days in Bali, north of Kuta Bali. I must admit we missed Kuta Lombok a lot. I 100% recommend you to go there! But not too many at once! However, if I would go to Kuta Lombok tomorrow, I would stick to your guide since prices are quite accurate! This looks like a fun place to travel, thanks for sharing!